DigiGlass printed interlayers offers unrivalled resolution and colour accuracy for artistic and photographic applications on glass. DigiGlass utilises SentryGlas Expressions® laminated safety glass technology, combined with weather tested robust inks to provide artistic solutions for a wide range of architectural designs. Laminated safety glass consists of a multilayered sandwich of glass panels and a strong polymer interlayer which provides adhesion and impact toughness. On this interlayer high resolution inkjet printing is applied with specially formulated inks to provide an artistic flair to any building project without compromising the integrity of the safety glass. The printing process is fast, efficient and versatile producing colours in a full CMYK colour palette and allowing continuous tonal shifts in any image you can provide. It is as flexible as your digital image, therefore solid colours, high density art or photography in one part of an image can transition to complete clarity somewhere else. These gradients are seamless and can deliver privacy by obstructing portions of the pane whilst still providing visuals throughout other sections. Digital files can be accepted in PSD, TIFF, JPEG, AI, EPS or PDF format. For more detailed information, please refer to our DigiGlass Artists Guide or contact us and ask to speak with a design consultant. 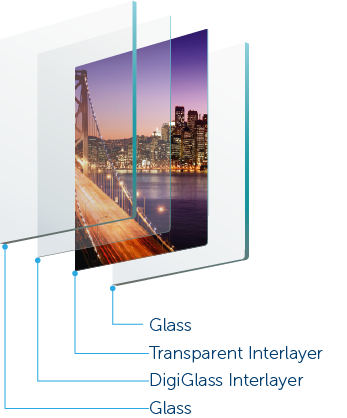 DigiGlass can be laminated to suit two transparency options and one fully obscured solution. The choice of transparency level varies depending on the desired light transmission, and lighting condition of the intended application. All DigiGlass is supported by our 10 year warranty against fading and discolouration from UV damage. The printed interlayer is encapsulated within the panels making it completely scratch proof. Digital files can be accepted in PSD, TIFF, JPEG, AI, EPS or PDF format. For more detailed information, please contact us and ask to speak with a design consultant.